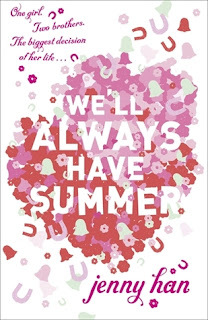 I have been desperate to read We'll always have summer from the minute I finished the second book in the series. I needed to know what was going to happen next and find out who, in the end, Belly would choose out of Jeremiah or Conrad. I loved this book as it put me straight into that summery feeling as soon as I started reading it. My mind was instantly back at the place it was when I first started the series. yes at times it was a bit predictable but definitely one of those comfort reads I crave every now and then. I really enjoyed getting to know Belly again and seeing where her life had gone. I actually loved seeing how she had changed as a person and seeing this in her new friendships. I loved seeing her with the fisher boys and seeing the pull that Conrad still had for her even though she was with Jeremiah. I actually thought some of the scenes were raw and moving and really enjoyed the love triangle aspect of this book as I finally started to get why exactly Belly had always carried a torch for Conrad even though I hadn't thought that he deserved it previously. Don't get me wrong there are a few things I haven't been keen on with this series. I hate the name Belly and think it is stupid beyond belief. I also really disliked how Belly was very instant on getting married, even before finishing college. I just thought the way she hung onto it as an idea when coming up against so much criticism was bonkers and actually a little creepy for my liking. For me the story ended brilliantly. I don't want to spoil for others but actually thinking back over it I don't think it could have ended any other way. A perfect end to a series I have adored.